Partly cloudy skies this morning will give way to occasional showers during the afternoon. High 58F. Winds ESE at 10 to 15 mph. Chance of rain 40%..
Cloudy skies this evening will become partly cloudy after midnight. Low 46F. Winds NE at 5 to 10 mph. 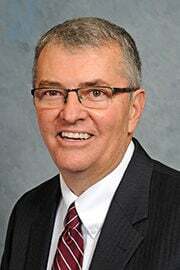 State Representative Tom Bennett remained hospitalized in Bloomington on Friday where he is recovering from injuries suffered in a car accident Thursday night in rural McLean County. According to his chief of staff, David Littlefield, the Republican from Gibson City was returning home from Pontiac when the accident happened between U.S. Route 24 and Colfax. He added Bennett was traveling alone, but he did not know the circumstances of the accident. The McLean County Sheriff's Department was notified at 9:03 p.m. Thursday of the single-vehicle accident at 2600 North and 3360 East Road between Colfax and Weston, but had no further details to provide Friday. Littlefield confirmed the 63-year-old Bennett sustained 10 broken ribs, including six in multiple places. Bennett, a teacher at the former Melvin-Sibley High School, is being treated at OSF HealthCare St. Joseph Medical Center in Bloomington. "He is resting and his daughter is there with him," said Littlefield. Bennett was in still in the hospital as of Monday, but he is improving. "They are hoping that this week he can be released, but nothing has been determined yet," commented Littlefield. "He's still recovering. I heard he was walking around this weekend so progress is being made." Since 2015, Bennett has represented the 106th District that comprises all or parts of Ford, Iroquois, Livingston, Vermilion and Woodford Counties. After teaching and prior to politics, Bennett worked as a manager, computer software developer and trainer at State Farm in Bloomington for 30 years.